Helping you be the best fur-parents ever! Gosh, it’s late here in the UK and I have been busy finishing the last few touches on module 2 of our feline colour genetics course for you guys…its finally done and published so check it out and enjoy! Poppy, our gorgeous product tester and assistant manager relaxing in her show bed with her ribbons…well done Princess Poppy! even had a fun outing at a GCCF cat show! 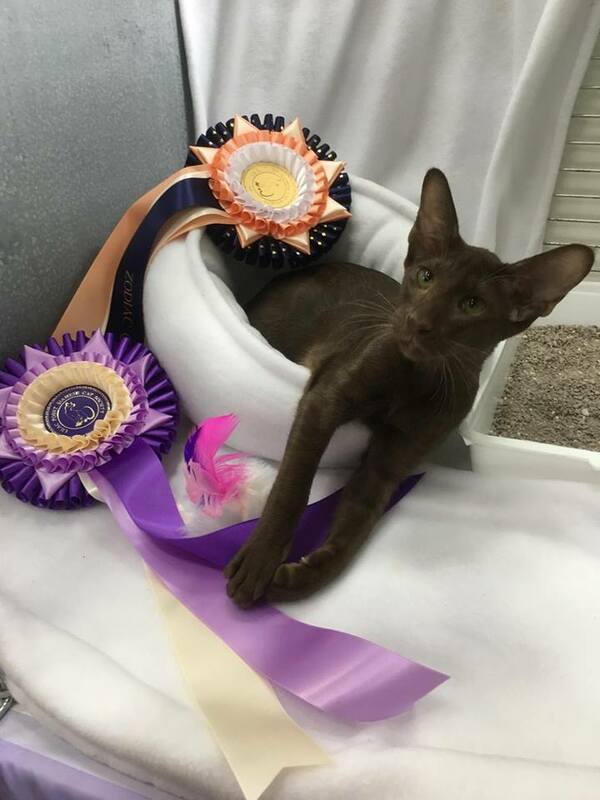 She came second in her breed class and first in the Zodiac kitten class where the entries were grouped based on their star sign. She had a great day and while she was a little nervous to begin with she soon learned that shows mean hugs and treats! She got loads of new toys and a bag of Royal canin breed specific food which was cool! I had been a diligent cat mum and stayed up late sewing my show whites so her show pen would be extra comfy and I am pleased to say that she loved her mini donut bed I made her especially for the show. We made some fantastic friends too and met some stunning cats! There was even a non-pedigree section where non pedigree neutered cats and kittens can compete for master cat titles and for pedigree cats who were of pet quality there was a pedigree pet section too so there really was something for everyone! If you are interested in having a go at a cat show then contact the GCCF who will be able to help you get started…otherwise we’d be happy to help you out and let you know how we first got started…Poppy just said we need and article on getting into showing cats so watch this space! I am excited to let you all know that we will be adding a list of some of the best selling rabbit gear so you can get excited thinking of bunny goodies for this autumn and winter! With the cold nights slowly drawing in it’s time to start thinking about getting everyone cosy! We have some great tips coming up for keeping our pups safe and well over these up and coming cold months as well as some fun things to do with your dog this autumn and winter! © Copywrite furkidz.org 2017 All rights reserved. All article and post content information must not be reproduced without prior permission from the administrator.